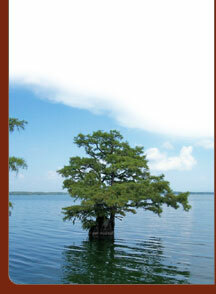 Whether it is legend or lore, truth or tale, almost everyone from the area knows the history of Reelfoot Lake. Facts are that the lake was formed in late 1811 through early 1812 by a series of great earthquakes, probably as large, or larger, than any known to North America. The area at the time was mainly Cypress forest of which some are still standing. In fact, one can see many standing around the lake and even more are beneath its waters. The beauty can not be told, it must be seen. Along with the earthquakes, the Mississippi River flowed backwards and filled the vast hole with water. Now there is fishing, hunting, boating, swimming, and more; nature at its best. The Chickasaw Indians and the 19th Century legend are to be told by the locals. Come and hear all about it.